It's a treasure trove of trouble! 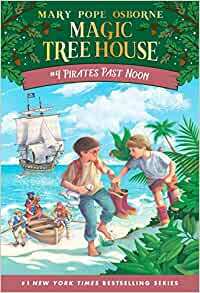 Jack and Annie are in for a high-seas adventure when the Magic Tree House whisks them back to the days of deserted islands, secret maps—and ruthless pirates! Will they discover a buried treasure? Or will they be forced to walk the plank? These books are a cry of relief from the five minute books we usually read with our son and they have already taught him so much about science, nature, and particularly history. Jack and Annie, the lead characters in the series, travel through time and meet with prominent historical figures such as Equipment Queens, take a trip to the moon, spend a day with Abraham Lincoln, land in camp with General George Washington as he is ready to cross the Delaware, and even convince a young Mozart to continue his pursuit in music. They are well written books that peak interest in subjects young kids may not yet have access to and have accompanying research guides that give detailed back stories and historical guides to the subjects covered in the novels. Although the intended audience of the series seem to be for children around 8 - 10, our five year old becomes engulfed in the stories every single evening, always looking forward to what adventure Jack and Annie are heading for next. Amazon also tend to have a wider availability of the series than book stores like Barnes and Nobel at prices up to half the cost of the same. My six-year-old nephew loves these books. I read them to him and enjoy them myself! They are mysteries that take the brother and sister to different times and places so they learn as they’re enjoying the mystery. My daughter is in Kindergarten and loves these books! She will not let me read them out of order though. It is a great series with a new adventure in each book. The characters are easy to relate to for children and I love the history/science/geography lesson that comes along with each one. Highly recommended for young "readers" as the chapters are short but the content is exciting. Love these books. If you child likes a new adventure this book is for them. The book is of good quality and perfect reading material for a 2nd grader.